River City Opens April 10th! Previews April 9th. Have you gotten your tickets? Shaken by her father’s death, Mary sets off to uncover three generations’ worth of secrets buried in the West End of Louisville, Kentucky. River City charts Mary’s discoveries, which span four decades, and investigates race, memory, and the ghosts that haunt one American family. Performance times are Fridays and Saturdays at 7:30 P.M. with Sunday matinees at 2:00 P.M. Preview on Thursday, April 9, 7:30 P.M.
Tickets $7 – $24 (group rates and various discounts available). Check website for details. Call (520) 882-7406 to purchase tickets and make your reservations. 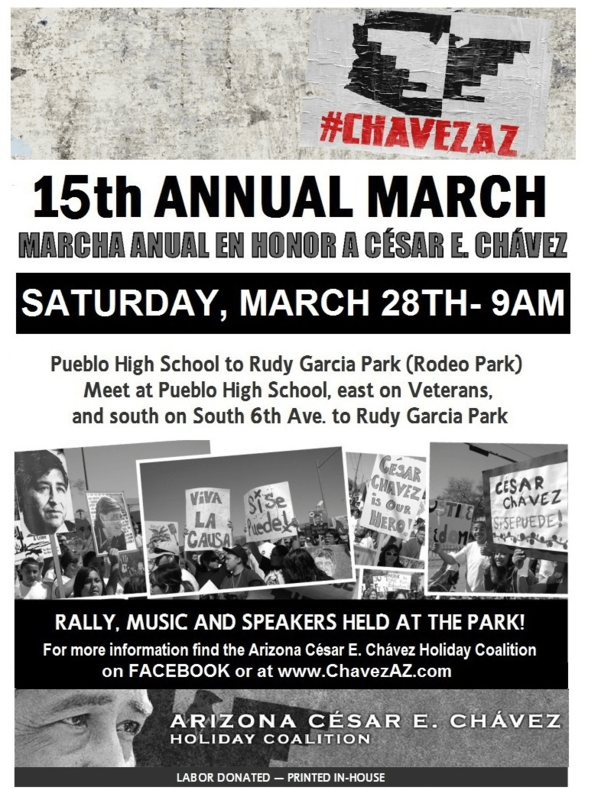 The 15th Annual Cesar Chavez March and Rally takes place this Saturday, March 28. Participants will meet at Pueblo High School at 9:00am. The march then proceeds to Rudy Garcia park where a Giant Puppet Performance of the Great Grape Strike written by Milta Ortiz will take place at approximately 9:45am or whenever the marchers arrive. Borderlands’ Giant Puppet spectacle, directed by Marc David Pinate, tells the story of the Delano Grape Strike and Boycott, when Filipino, Mexican, and Chican@ farm workers formed the first farm worker’s union. After years of strikes, brutal beatings by police and strike breakers, fasts by Cesar, the famous march to Sacramento, and a national grape boycott campaign, farm growers finally capitulated to workers demands for basic worker rights and protections. 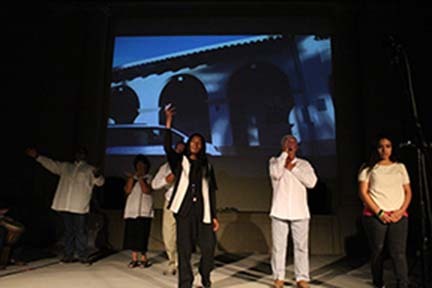 Borderlands is honored to add this new theatrical extravaganza to an important community celebration of Chican@ s/heroes. Over 60 volunteers and 8 professional artists/designers helped build the puppets over five weekends. Local leaders Supervisor Richard Elias, Marisol Flores-Aguirre of REA Marketing, and Governing School Board Member Cam Juarez lent their voices to the sound track mixed by Jim Klingenfus; and Fabrics-That-Go donated over 100 yards of fabric. Come out Saturday and experience what community arts looks like! 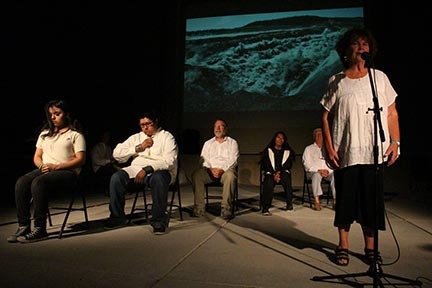 Last week’s Community Artists Gathering in Ajo, hosted by the International Sonoran Desert Alliance (ISDA) saw the coming together of dozens of artists and performers from across the country and the state. The five day event centered around the role of art in community building. Fellow Tucson performers Yvonne Montoya, director of SAFOS Dance Theatre; and dynamic duo Logan Philips and Adam Cooper-Teran of Verbobala also represented Chukson in grand fashion. 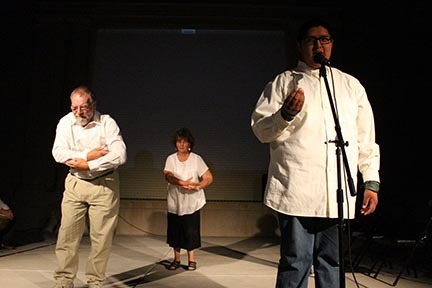 Borderlands Theater’s producing director, Marc David Pinate, collaborated with Ajo based performers – the Nano Players, musician Ted Moore, and videographer Mel Ortega – to devise a performance about memory, oral history, and crossing cultural lines. 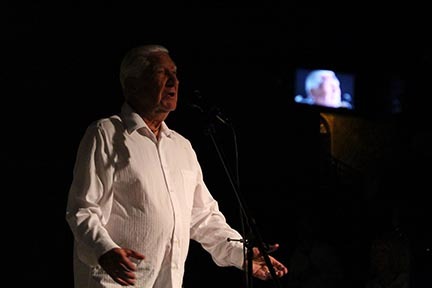 Using elements of story telling, movement, video projections, borrowed text, and music, the group worked for four days presenting the result of their workshop on the last night of the conference. The work in progress was well received, capturing the heartfelt personal narratives of Ajo residents past and present. Borderlands hopes to expand on this project and other collaborations with ISDA in the near future. 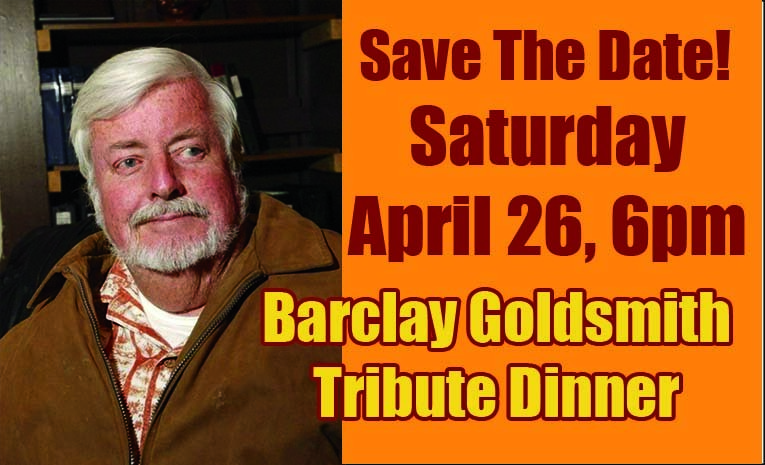 Or buy individual tickets online for Barclay’s Tribute Dinner! If you have any questions please do not hesitate to get in contact with us. See you at the theater!